High Altitude Science have improved their popular but expensive flight computer by adding an APRS radio module to down link the tracker information in real time. The radio module allows you to track your Eagle flight computer with live data anywhere in where you can use APRS devices on aircraft. The Radio Bug APRS tracker plugs into our Eagle Flight Computer’s S1 Port and transmits your payload’s position, altitude, speed, temperature, and pressure once every minute. 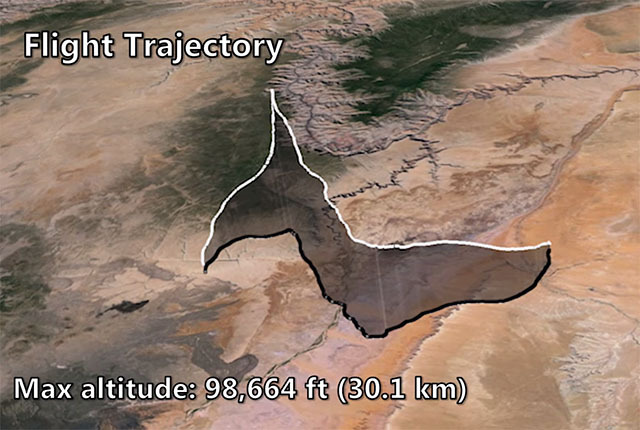 Because the Eagle Flight Computer’s GPS receiver works above 18,000 m (~60,000 ft), users will be able to track payloads all the way up to burst altitude. The APRS system uses a network of hundreds of IGates (internet gates) distributed across many countries to receive the data transmitted by HAS trackers. 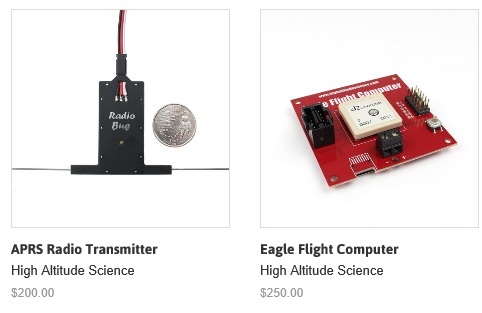 The Radio Bug is a state of the art APRS transmitter designed specifically for weather balloon tracking. 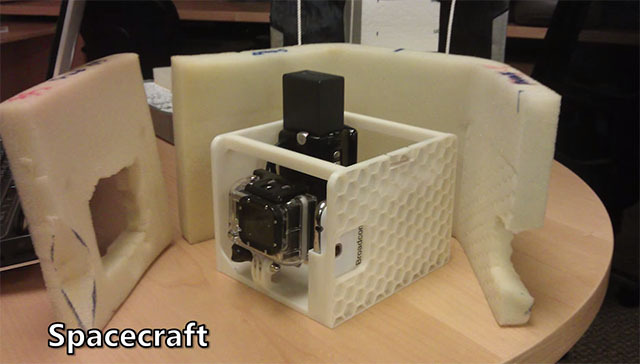 At just under 25 grams it requires less than one cubic foot of helium to compensate for the extra weight. The Radio Bug has a 250 mW transmitter mounted in the center of a dipole antenna. 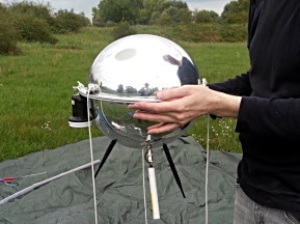 This is the most effective antenna for tracking weather balloon payloads over long distances. 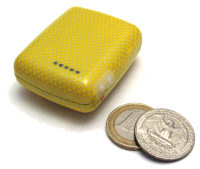 This device cannot be used in the UK, but the UKHAS does provide information on where it can be used. Just follow this link. There is only one place you could find such an article. It’s in Odd box. If your high altitude balloon has ever landed on a house then spare a thought for the Project Loon recovery team who had to attend an Los Angeles home where one of their huge balloons had landed. CHINO HILLS >> An over-sized balloon believed to be developed by Google crash-landed into a palm tree early Saturday morning, leaving neighbors startled by the contraption. It didn’t take residents long to figure out what the white polyurethane material was that was stuck between the lawns of two homes in the 1600 block of Rancho Hills Drive. Sheriff’s deputies came out to the site because the company that owned the balloon reported it had crash-landed, said resident Gina Hernandez. Hernandez said she was told the device is called Project Loon and is being used to provide Internet access to rural and remote areas. By noon, crews had come to retrieve the device, but Hernandez said that all throughout the morning people had stopped to snap photos of the deflated balloon. “Oh, people were taking pictures, and taking pictures of themselves in front of them. It was quite the spectacle,” she said. It was shortly before 6 a.m. when Hernandez heard what sounded like a cement truck driving past the house. “We didn’t know what it was, but it wasn’t a loud boom,” she said. Then her husband went out to get the newspaper at 6:30 a.m. The balloon had crash-landed on a neighbor’s palm tree and parts of it had spilled into her driveway, she said. Initially, Hernandez said she wasn’t sure what to make of the contraption and if it was safe to be near it. “It was kind of creepy looking,” she said. Hernandez said she was grateful the device landed on the palm tree. Many HAB ‘frequent fliers’ have at some point lost a payload. The reasons are may and varied, and I have had my own experience. You should never give up hope of recovering the payload and here is a heart warming story from the US. 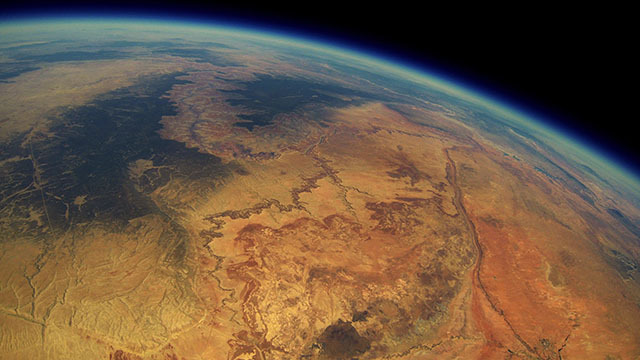 Back in 2013, five friends in Arizona decided to capture some photos and video from the edge of space by sending a GoPro up on a weather balloon. 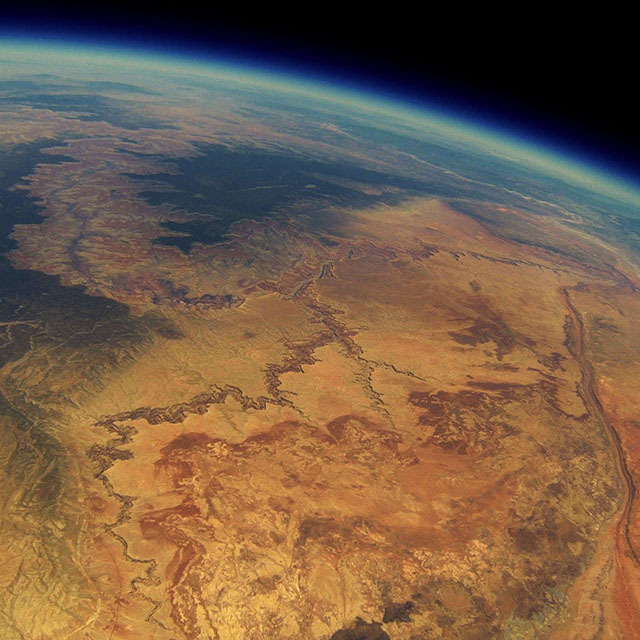 The camera made it to 98,000 feet, but the guys lost track of it after it landed out of cell phone tower range. All seemed lost, and the team spent months wondering if they’d ever find the camera. Fast forward to a couple of months ago: the team got a phone call from a woman who found a strange box with their names on it. In it was the camera and all of the original images. 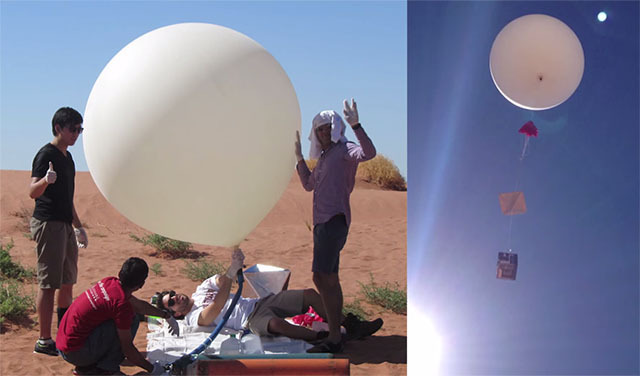 The balloon’s payload was a GoPro HERO3, a Sony Camcorder, and a Samsung Galaxy Note II phone. The two cameras were set to record footage while the phone snapped photos. Over on Reddit, team member Bryan Chan writes that the smartphone was also used for tracking the location on the memory card. 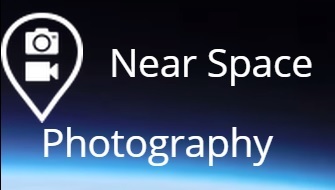 An app was used to have the phone text its GPS location to the team as it traveled back down to Earth. “The problem was that the coverage map we were relying on (looking at you, AT&T) was not accurate, so the phone never got signal as it came back to Earth, and we never heard from it,” writes Chan. The camera box landed about 50 miles away from the launch point, in an area largely devoid of public roads. The onboard data revealed that the camera had a total flight time of 1 hour and 38 minutes, and it reached an altitude of 98,644 feet. In case you’re wondering about the safety aspect of this type of project, the team says it registered their launch details with the FAA and received clearance for a specific location and time window.